"That's a really good question," Murray said to me during an interview in a hotel a few blocks from the convention centre. "Everyone just thinks sci-fi is future. Sci-fi is just alternate to me. It's just our version of the universe, an interesting universe, and I think one that's hopefully quite surprising and interesting to explore rather than our universe, which would be reasonably boring." As he walked around the brightly coloured planet they had showed off in a trailer at Sony's press conference, he touched a button that highlighted a transparent geometric pattern over areas of the ground that could be mined for resources. Resources can be used to improve your suit, he later explained to me. That's the only sense of "levelling" you'll find in No Man's Sky. You can improve your character through your suit, your weapon, and by buying new ships. You can't customise your ship. You buy newer, better ones. "It's not levelling up and there's not a tree it's just that when you go to a space station there will be some ships docked there sometimes," Murray explained. "If there are, you can try to buy those ships. You're not trying to customise those ships. It's just there's this hopefully real, working universe and you'd travel as you'd expect." If you asked the people paying attention what No Man's Sky is you might hear a few common phrases: space battles, exploration, colour, great music (that one might be from me specifically). The biggest talking point, though, is obvious: procedural generation. In a gigantic, explorable universe, there are lots of possibilities. Many variations of creatures and trees and spaceships and caves and everything else that you can see. I asked Murray how you would go about "levelling up" to get better suits and weapons. "I could do it just by exploring," he said. "I could do it by taking guys out like this [Murray lifts his controller a bit to emphasise that he is flying in space and shooting other ships]. So if I go up to that fleet that was being attacked I could've joined in and attacked one of the freighters and get a little reward for that." "There are opportunities to interact with other players, but we're not trying to make an MMO and we're not trying to make a traditional multiplayer because it just doesn't suit that," Murray said. "You and I, when we play, we will be light years apart and we have no control over that, where we start off. We can try to fly to the same place and if we do we'll see the same things and we can make certain drops and do interactions between each other. But we're not all flying to one planet and then having a run around together. What I would be after is something Journey-esque. You know that you were playing with other people, but you're not saying, "Hey! Join me in Journey for a quick game!" 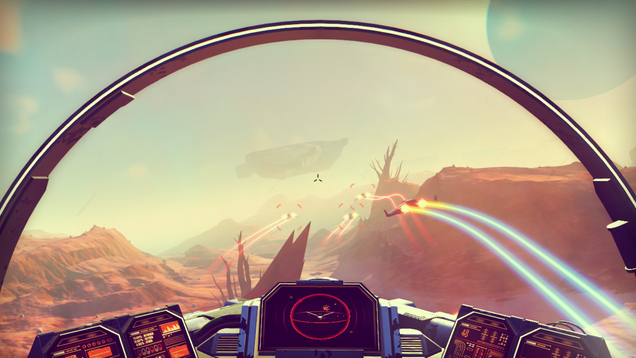 We still don't know too much about No Man's Sky, but I think that's partially the point. There's a story and a protagonist and there's even a gun, but that's not what Sean Murray or Hello Games wants you to think about when you see or hear about No Man's Sky. And when the buzz out of E3 is all about how No Man's Sky seems so full of possibilities, so full of colours and freedom to play and explore, it seems like that method is working.